Produktinformationen "Domaine de Chevalier (Domaine de Chevalier)"
"In late 2011, I had the last bottle in my cellar of the 1970 Domaine de Chevalier. Much to my surprise, it was still holding on to life and remained gorgeously complex in that ethereal Graves style. 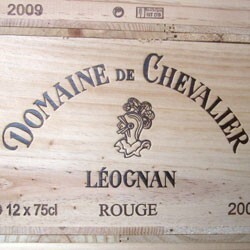 The 2009, one of the finest Domaine de Chevaliers yet produced, reveals a striking bouquet of burning embers, sweet cherry, black and red currant fruit, spice box, cedar and lead pencil shavings. The tannins are sweet in this fleshy, full-bodied offering. It is built on the notion of extraordinary harmony, elegance and complexity. While not the most concentrated or flamboyant 2009, its intense aromas are already reasonably evolved and its lusciousness and balance are terrific. Made from an interesting blend of 64% Cabernet Sauvignon, 30% Merlot and 6% Petit Verdot, its yields of 45 hectoliters per hectare were slightly higher than many of its neighbors achieved. Drink it over the next 25 years." Weiterführende Links zu "Domaine de Chevalier (Domaine de Chevalier)"
Unser Kommentar zu "Domaine de Chevalier (Domaine de Chevalier)"